Free Shipping Included! 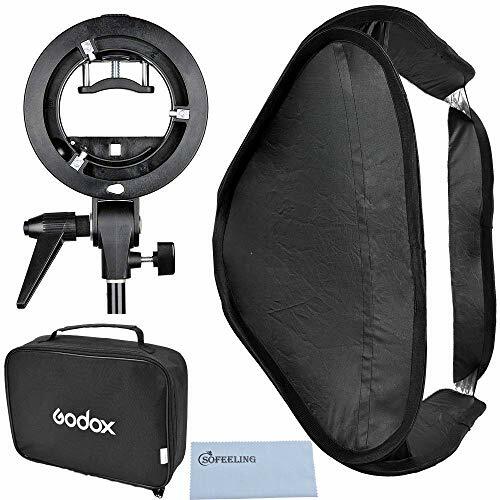 Godox 60x60cm/24x24in Foldable Universal Softbox with S Style Speedlite Bracket for Flash Bowens Mount Accessories Direction Adjustable (60cmX60cm Set) by Godox at Style Cares. MPN: GSOFTBOX. Hurry! Limited time offer. Offer valid only while supplies last. Bowens mount adds most studio flash accessories, softbox, reflector. Mount size is adjustable to fit all brands of speedlites and even Godox AD-360. Unique speedlite mounting way: mounted horizontally or vertically by wrapping speedlite body. Reliable mounting: not require Velcro, no pressure on hotshoe, no metal scratches on speedlites.